Suddenly—unexpectedly—I finished the construction phase of my boat. I keep flipping through the directions, assuming that there must be another board to cut and glue but, no, it’s all done. I can put away the drill and circular saw. Sanding and filling the cockpit. It's not fun--but it's not hard. The official last step was to cut out the oval portholes. I don’t need to install the windows at this point, but when that time comes I will fabricate my own from some leftover Plexiglas gathering dust in my woodshop, which saves some money and feels pleasantly frugal. Other builders, I notice, opt for more expensive ready-made portholes, but these can cost $100 or more–$400 in all for a set. There is also a growing trend to use inexpensive “inspection hatches,” which are more typically used to provide access to watertight hatches. But it’s possible to also use them for portholes, even if they don’t look quite as fancy. They also cost much less—about $10 to $15 per window. There will be more cutting later. Aside from the portholes, I still need to assemble the mast and there are two or three small decorative details that will be added at the last minute. But I don’t need to worry about any of that right now. For the moment, I am fully occupied by the long-dreaded task of filling holes with epoxy and sanding everything smooth. It’s time consuming and, frankly, unpleasant work. The weather turned hot and muggy last week and I feel like my whole body is covered in a fuzz of sawdust after even a few minutes with the belt sander. For health reasons, I wear a respirator when sanding the epoxied surface, which is awkward and uncomfortable. It really is not possible to wax poetic about the ancient art of boat building after a half hour of this sort of work. On the other hand, it’s not hard work. I just have to mix up a batch of epoxy, thicken it with wood flour, dab a bit in each screw hole, and smear a bit more along the seams and joints. I then smooth it down with a rubber paddle; it’s just like spreading joint compound on drywall. For the inside seams, I smooth a bead of epoxy with a popsicle stick or, in a pinch, my gloved fingers. As my knowledge of epoxy grows, the quality and speed of my work improves. One important discovery was that I should use “slow” hardener in warm weather. Two part epoxies can be mixed with “fast,” “medium” or “slow” hardeners, which (obviously enough) regulates the speed of the hardening process. When I bought my first gallon of epoxy last year, I followed the recommendation of an online correspondent who said that “medium” hardener was a good all round choice. Which it is—as long as the temperature stays below, oh, about 75 degrees. In warmer weather, it wants to “kick” (begin the hardening process) almost immediately, which meant that I had to work at full speed every time I mixed up a batch. If I waited too long, the epoxy would generate so much heat that it would melt the plastic cups I use to mix the adhesive and quickly turn into a rock-hard mass. In contrast, “slow” hardener allows me to work at my leisure and I’m able to fill holes with more care and in a more thoughtful way. If you are building a boat in the summer, the right hardener makes all the difference. Everyone hates sanding and there are many jokes about the drudgery of the work. I think one builder even named his craft “50 Grit,” reflecting his feeling that all he did was sand. But I find that the work goes quickly. Since the wood will be covered by fiberglass, I don’t need to sand the wood a mirror-smooth surface, which means that I only need to grind down the rough spots. While epoxy is hard, it quickly yields to a sander and I can cover a great deal of territory quickly. By the end of the weekend, I had filled and sanded the entire cockpit, which is probably the hardest part to finish. I was even able to move on to the cabin roof. 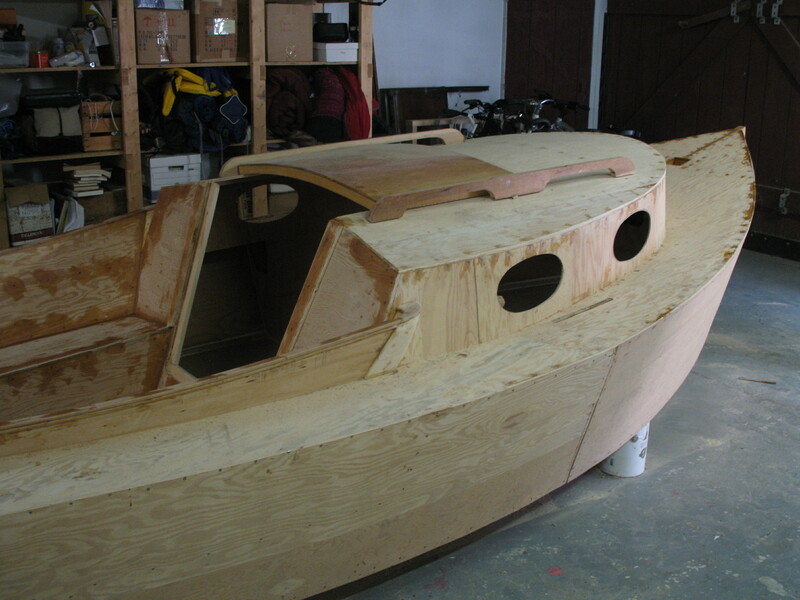 I learned not to make predictions, but at this rate, I should be ready to turn the boat over (which is another source of anxiety) within a week so that I can sand the underside and, from there, begin the fiberglassing process. 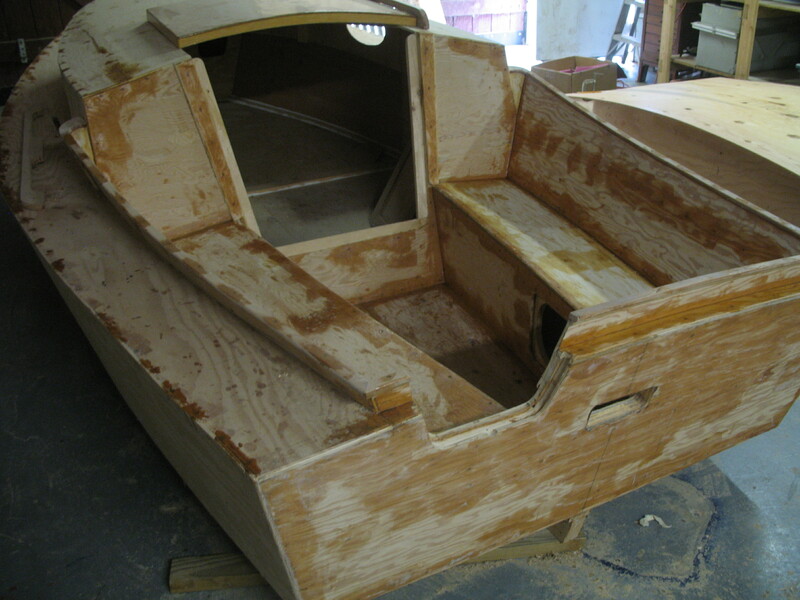 This entry was posted on Monday, June 14th, 2010 at 8:21 am and is filed under Sanding and Fiberglassing. You can follow any responses to this entry through the RSS 2.0 feed. You can leave a response, or trackback from your own site.